A specialist in traditional and private-label jams for over 60 years now, Andrésy is constantly looking for fresh challenges to satisfy a demanding clientele. Its Andrésy Origines range appeals to great chefs all over the world. Andrésy Origines is one of the three ranges in the Prestige collection, which also includes Andrésy Gourmet and Andrésy Nature. The collection began when 4* and 5* hotels first appeared in France and Andrésy was keen to demonstrate its know-how by bringing them outstanding products. To create Andrésy Origines, the company’s collection of recipes had to be revised and enhanced. The aim was to spotlight all the goodness of certain fruit from traditional growing areas in France and Europe, which stand out for their taste qualities, aroma and ability to retain their shape when cooked. Andrésy selected around 15 of them, including the Roussillon apricot, the thin-skinned Endega blackcurrant from Île-de-France, whose very firm berries remain whole when cooked, the Senga strawberry, the Seville orange with its highly sought-after bitterness, rhubarb from Picardy and the mirabelle plum from Lorraine. 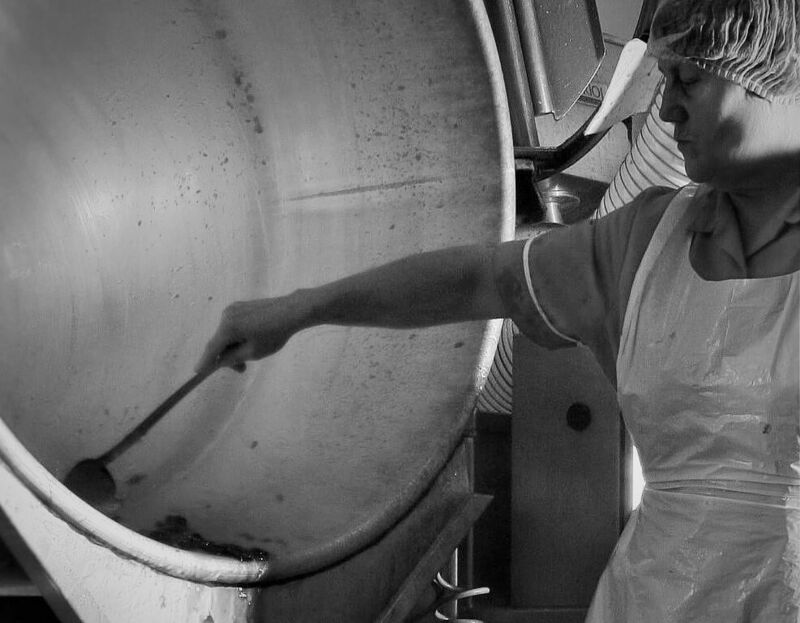 To obtain the much sought-after, melt-in-the-mouth extra jams, the fruit is picked very delicately at maturity, cooked in a copper jam pan in small quantities to keep the fruit in perfect shape, with 56% sugar content: the legal minimum. Andrésy Origines comes in numerous traditional or more inventive flavours. Uncompromising chefs in France and around the world were quick to recognise its superiority and include these jams in their food service and room service ranges. The jams arrived on the international tables and buffets of the Sofitel and Pullman hotels, luxury hotels in Paris, Cannes and Deauville, and crossed the seas to Seoul and Dubai. They are also served to first-class train passengers and selected by luxury yachts and cruise boats. In Dubai, Emirates Airlines has been serving Andrésy Origines jams for the last two years. They are reserved for the exclusive breakfasts of its best customers: the tourists and businessmen travelling first-class. Outstanding recipes call for beautifully-made, refined packaging. Gérard Cassan, at the helm of the family company in 2011, created the design himself. The grooved design of Andrésy Origines’ little jars is the only one of its kind in the world. It evokes the solidity and lightness of Greek columns and, for some diners, brings to mind the Petits Suisses of their childhood. The labels were drawn by an artist. They represent each type of fruit, so that the jam is identifiable in any country, whatever the language spoken. The Prestige collection is the perfect match for all gourmet breakfasts. 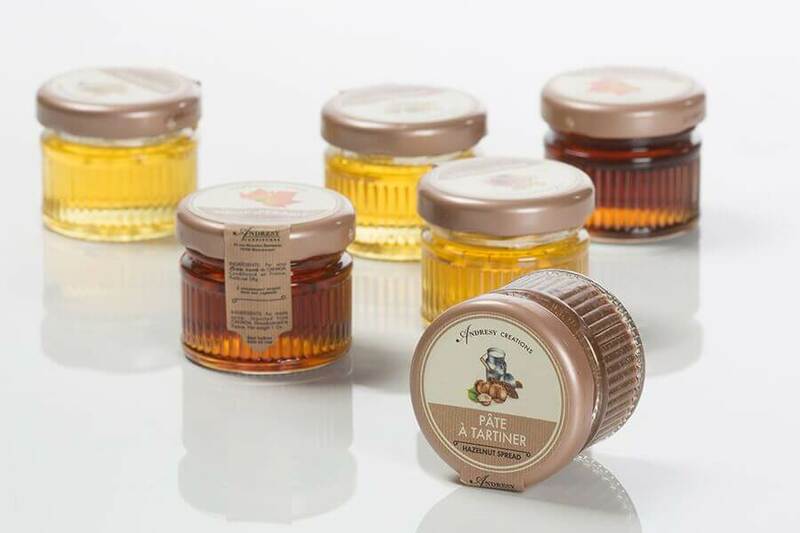 It includes the Andrésy Nature range with its honeys – acacia honey, multi-floral honey, creamy honey – its Canadian maple syrup, and its varieties of spread, which are just as delicious eaten from a spoon, spread, or used to garnish pancakes, waffles and French toast. 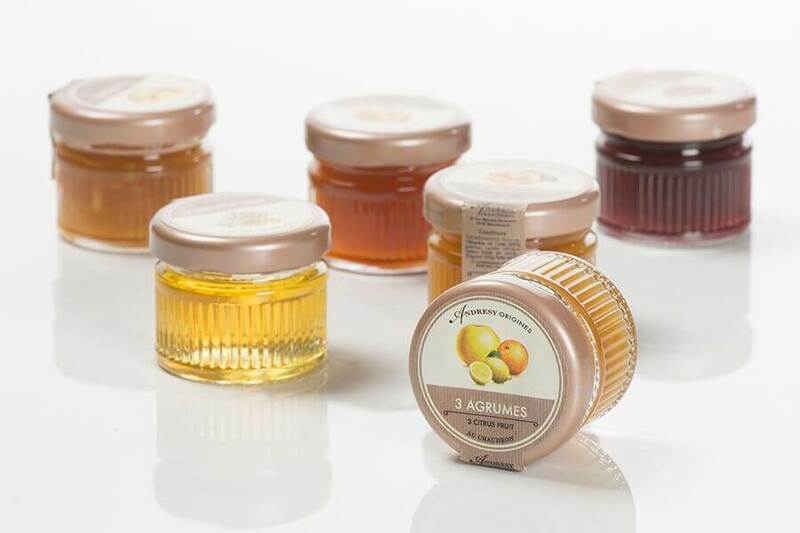 Hotels and gourmet grocery shops can choose large jar from the Andrésy Gourmets range. These are traditional recipes; blended flavours, such as peach and apricot, full-fruit organic creations, sweetened with fruit juice or grape must. By making Andrésy’s luxury jams a fixture, certain establishments choose to stand out from the crowd and offer their clientele a few grams of gastronomy and French tradition.